The last thing fans at the DCI Orlando event on Saturday were expecting, maybe even less than an upset victory by Carolina Crown, was a guest performance by the Madison Scouts who that same day were more than 1,800 miles away in Denver, Colo. When the Scouts suddenly made a surprise appearance at the Orlando Citrus Bowl, fans were talking about how they looked 10 feet tall! But this wasn't just stretching the truth or looking sharp in a new uniform. 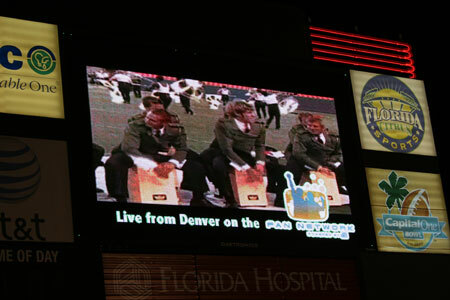 The Men of Madison were really larger than life, as they appeared on the stadium video board live in competition from the Drums Along the Rockies contest. The Madison Scouts on the video scoreboard at the Orlando Citrus Bowl. Thanks to the power of the DCI Fan Network, Madison's performance was part of a Drum Corps International first, with fans at one Premier Event watching live video coverage from another. "Now this is one heck of a good use for electronics in drum corps!" said Bill Rogers of Oviedo, Fla. after he saw the Scouts take the screen. Soon after as the emcee announced to the Denver crowd that they were joined by audience members in Orlando, both venues erupted with cheers for this first-ever DCI techno feat. Visit the Fan Network today.